Ocean Cities are where landscapes and seascapes meet, where human behaviour and urban development have a profound impact on marine health and climate change. Marine and coastal ecosystems are the largest carbon sink in the world and a vital source of livelihood, employment, nutrition and economic growth in cities and islands. Yet, the capacity of these ecosystems to balance our climate, protect our coastlines, and sustain human development is acutely threatened. Marine pollution and urban run-off, unsustainable coastal development and poor marine governance, rising sea levels, ocean warming and acidification endanger the health of our ocean and erode the very foundation Ocean Cities are built on. For Pacific island settlements, the nexus between urban development, climate change and the ocean is of critical importance since most island communities are coastal, with some smaller island and atoll nations under five meters of elevation. Together with their regional partners, Ocean Cities of the Pacific islands can pioneer ocean-focused, climate resilient solutions for sustainable development. Recognizing and understanding the interconnections and interdependent futures between cities and the ocean will catalyse integrated responses to increase resilience, protect ecosystems, and meet the challenges of rapidly urbanizing island societies. This policy brief outlines the challenges of unplanned rapid urban expansion and deteriorating ocean health, urban resilience and climate impacts on Ocean Cities. 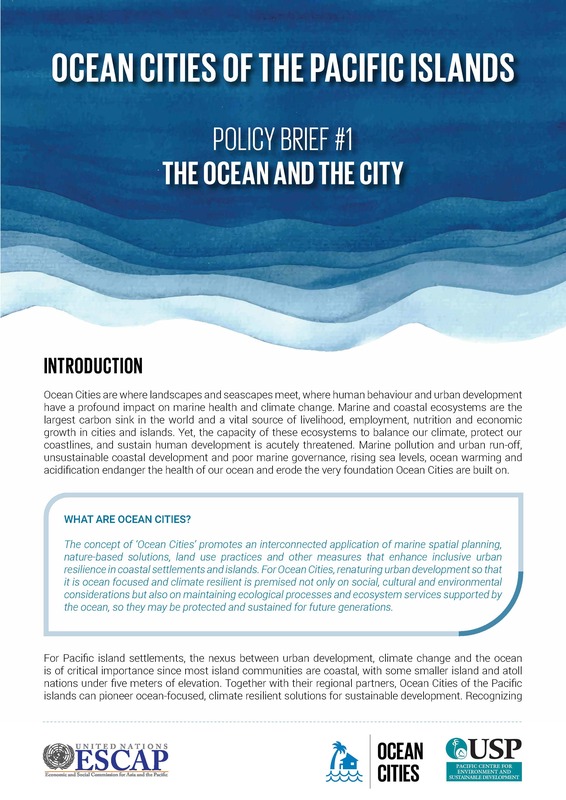 Associated opportunities for ocean friendly climate responsive urban development in Pacific islands are discussed in policy briefs two and three of this series. Even if global warming is limited to 2°C, sea levels could continue to rise by over 5 meters over the following centuries, posing a serious threat to low-lying Ocean Cities of the Pacific islands as most urban areas are located ≤5 meters above sea level.